Michael Bisping is playing UFC since 2004 to present. In his career have 33 match so far, wins 26 matches and 15 of them come at knockout 4 by Submission and 7 by decision he have losses 7 match in his 11 years career. This 36 years of age is a mixed martial artist as well. Currently he is the world no. 10 at UFC middleweight and former The Ultimate Fighter 3 winner. 40 years of age former UFC Middleweight Champion is currently world no. 4 at UFC ranking. His last years career earning was $5,097,000. Anderson Silva have 34 matches’ wins and 20 was by knockout in his 40 career matches. Silva is the most consecutive title defeated of UFC Championship. And he is the most consecutive winning record holder in UFC history as well (16). Former no.1 UFC champion got retired at 2013 from MMA. He have total 25 wins in his 27 career games. 2 times UFC Welterweight Championship winner have Most 19 wins in UFC history and most 12 wins by decision. Chuck Liddell have 20 wins in 22 kickboxing matches and 16 of them was comes by knockout loses just 2 matches in his career and in Mixed martial arts have 21 wins in 29 matches and 13 of them comes by knock-out. Liddell is the most number of knockouts winner (10) at UFC and Light Heavyweight division as well. 40 years of age American UFC fighter is playing since 1997 to present and he is the 9th induced into UFC Hall of Fame at 7th July 2012. Currently as per MMA ranking Ortiz is the no. 8th. This American is the most fight holder in UFC history (27) and most 15 wins in Light Heavyweight division. Rashad Evans have $3,778,000 yearly income from UFC and that makes him 6th highest paid UFC fighter at 2015. This MMA fighter have one UFC Light Heavyweight Championship title and 19 wins in this 23MixedMartials arts. Played since 2003 to Present and have 22 wins in 28 Mixed Martials arts. 9 out of 22 wins comes at knock outs. One time UFC Light Heavyweight championship title winner have 4 times Knockout of the Night. Big name at number 10. Have 34 career wins in 45 matches he was the 200o Rings of King’s title winner was the Fighter of the year at 2002. 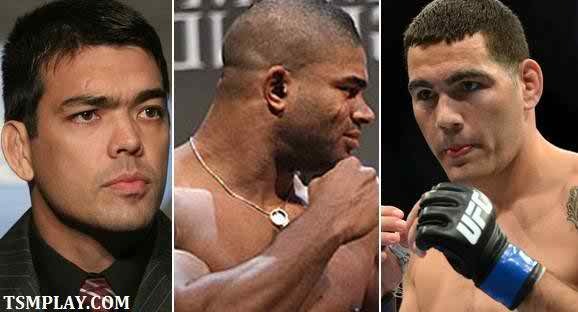 One times UFC Heavyweight Championship winner have 2 Fight of the Night title.